Saturday 15 November in Forbes. A symposium exploring the benefits of culture in rural communities, looking at the impact of festivals, creative industries and tourism. All welcome. 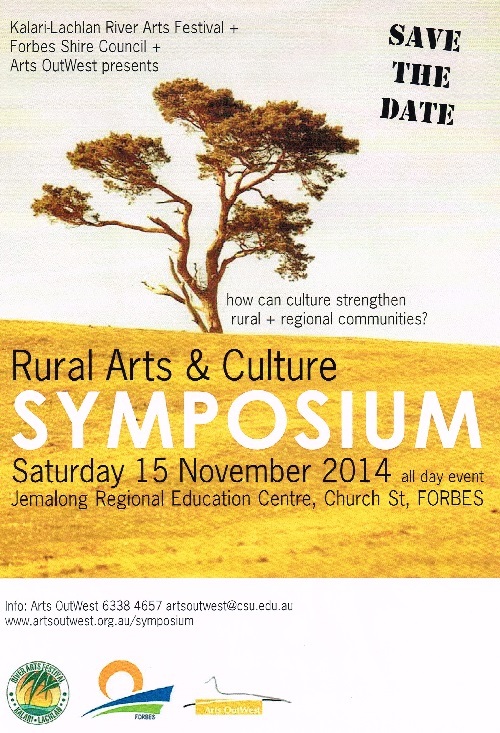 So please join us, Saturday 15 November, to explore how the arts and creativity can transform small country towns. With a special focus on rural arts & cultural festivals. Posted 6 October 2014. Last updated 14 November 2014. Revised 18 November 2014. This entry was posted in community arts development, Forbes, River Arts Festival, rural arts festivals and tagged arts, Arts OutWest, creative industries, cultural development, Forbes, rural arts festivals, rural communities. Bookmark the permalink.